I have just been reading the new book by Chip and Dan Heath: “Decisive: How to Make Better Choices in Life and Work”. It is a fascinating read, with a review of “villains” of decision-making, and a process to avoid them. The bulk of the book talks you through the WRAP process, with plenty of juicy anecdotes to illustrate villains and process at work. One of the most provoking things for me was thinking about villain 3, the impact of short-term emotions on our ability to make sound decisions. those immediately experienced while deliberating and deciding. These may be connected to the decision at hand, to the current environment, or the dispositional affect of the person. This leads me in two directions. The first is how much can we master ourselves to be aware of our emotional state? And how much of our emotional state is below the level of our conscious awareness and/or mastery? Let’s not lose hope here – but for most of us, we shouldn’t pin all our hopes on this either. Sleep on it: Yes, we all know this one, but do we really do it? 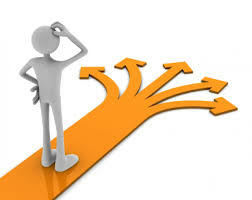 Very few decisions have to be taken on the spot, yet so often we can act like urgent and immediate action is required. 10-10-10: Use Suzy Welch’s 3 questions to create distance and perspective (see March 2013 for more details):How will I feel about this decision 10 minutes from now? How will I feel about it 10 months from now? Imagine you were advising your best friend: what would you tell him/her to do in this situation? No rocket science here, but simple questions and tips to help us detach from our emotions and achieve the clarity we need for good decision-making.